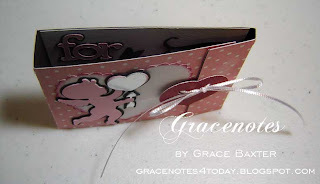 1st Birthday, Engagement and Valentine cards are now posted! I know I am late in posting these cards, but I couldn't risk my peeps seeing them on my blog before they actually received them. The last recipient just got hers in the mail, so I can now share them all with the rest of you. All my cards are 5.5 x 4.25 which is the A2 card size. I like the size and envelopes are easy to find. Be sure to click on the photos to see an enlargement of the pic. This one was created for my grown son who is still a big kid at heart. I knew he'd love the gumball machine, and he did! The details of how I made this would be quite lengthy. I am happy to share them with anyone wishing to try one of these. Notice the "glass" globe? That was so much fun to create. I was quite pleased with myself when this worked out. 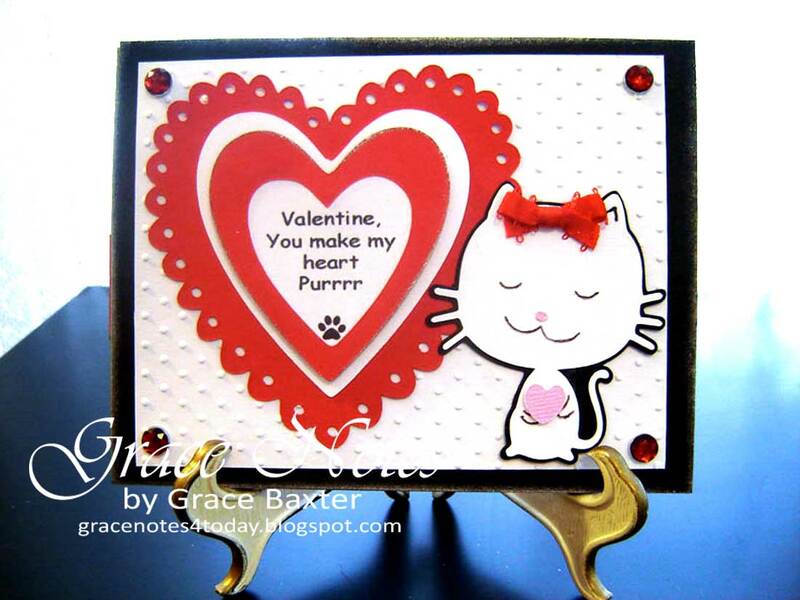 Next up is the love kitten for my daughter who also happens to have a wonderful "Kittie". Don't miss the tiny paw print in the heart. 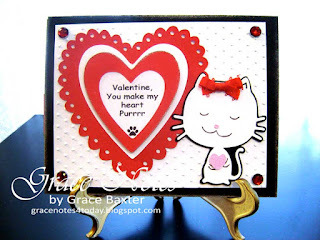 The pink heart that Kittie is holding is popped to make it jump out. The sentiment was created on my computer. This next card was made on a day when I was longing for Spring. February is, after all, still winter so I tried to be realistic in my design. I loved the little tree, bare and laden with thick snow. The tree needed some love so I added a variety of hearts. 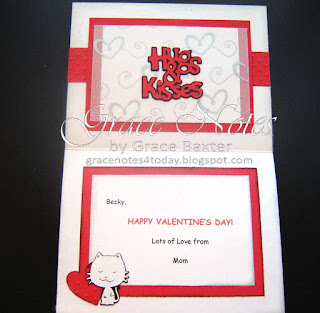 For shine, the sentiment is matted in red, then silver with tiny silver heart brads to match. But once I added the wee bird underneath the tree, it made me happy. 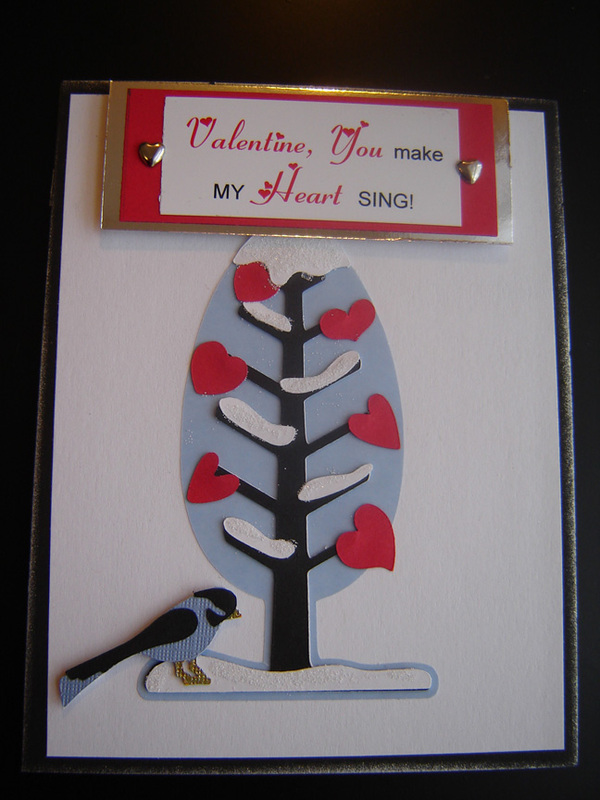 Birds were actually chirping outside my window as I worked on the card. The recipient? My other daughter who also loves to sing. 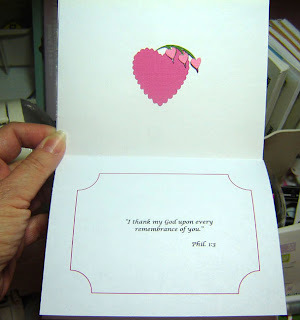 The next few cards are all pink and girlie. These two both have roses but that is where the similarity ends. 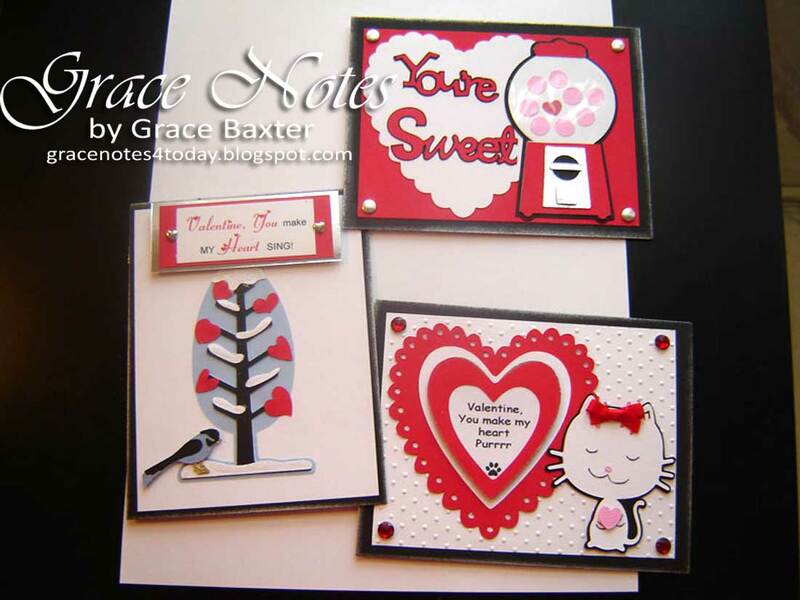 Each one has its own embossing, silver accents and bling. I loved how cute these ones looked standing side by side. I'll show you each one individually next. All my sisters enjoy gardening so I knew their cards needed to include flowers. You can't go wrong with roses. What would Valentine's Day be without roses! 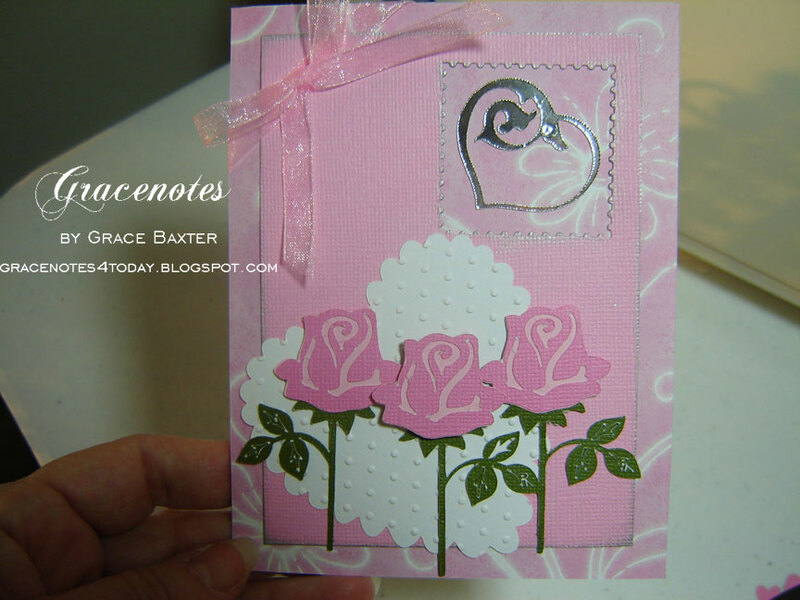 On this one, the card base is white then overlaid with a pink print. I added an embossed panel of birds and leafy vines (click for closeup). The stars of the show, however, are the roses... deep pink with paler petal details. The rose leaves are surprisingly life-like. 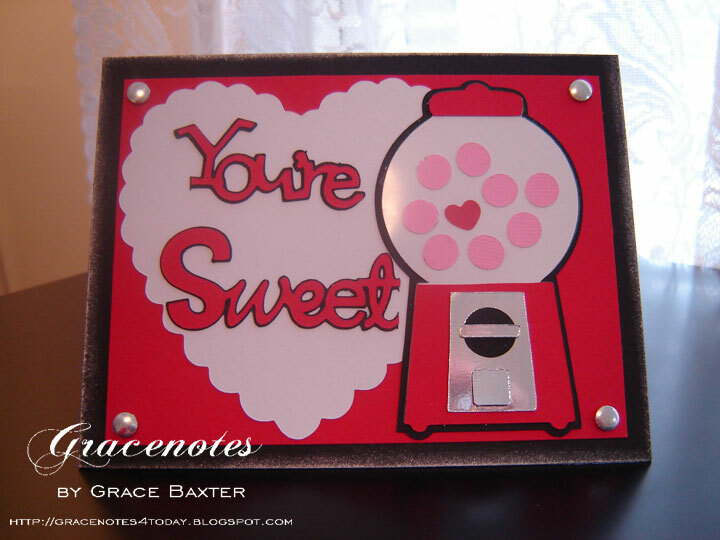 The silver heart with sentiment is raised with pop dots, and I used vellum to shadow the heart. Roses are from Walk In My Garden. Now, here is a happy accident. Don't you love it when those happen! While trying something different I ended up with a square of pink that had a stamp-sized hole in it. As soon as I laid it on top of my background I knew what it needed... a silver, bejeweled heart inside! To emphasize the stamp-shaped hole, I inked the edges with silver. It ended up looking so good, I tried to replicate it again but couldn't get the same look. 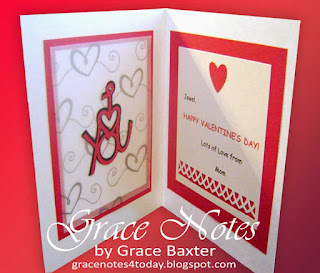 So this little card is very special and I am probably the only one who appreciates why. Okay, so having made 2 cards with roses, I wanted something else... still floral, still Valentines-ish. I searched all my cartridges and rediscovered something on the Walk In My Garden cartridge. How perfect. Bleeding hearts! But not just one little spray would do. I wanted a shower of them! On top of the dotted base stock I added some wide sparkly ribbon. 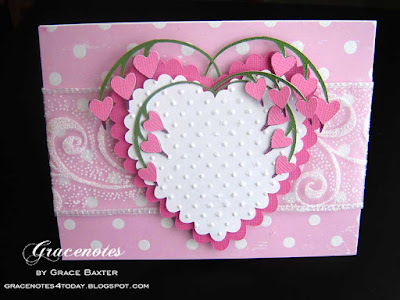 Then I cut two hearts; a large scalloped one in dark pink and a white one. 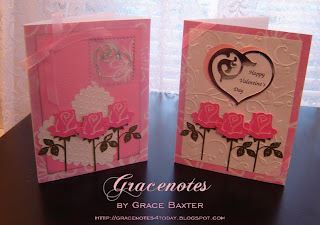 The white I embossed with dotted swiss and "popped" it on top of the pink one. But before gluing anything down, I created tons of bleeding hearts in two sizes. The tips of the bleeding hearts were green after cutting the stems, so I hand painted each tiny heart tip with pink glitter ink. The hearts look just like the ones I used to have growing in my back garden. The effect was just what I was going for. I must remember to tell my sister the story about the bleeding hearts, as told to me by our Mother. And all the while I was cutting, painting and gluing these hearts I was smiling, remembering that story. 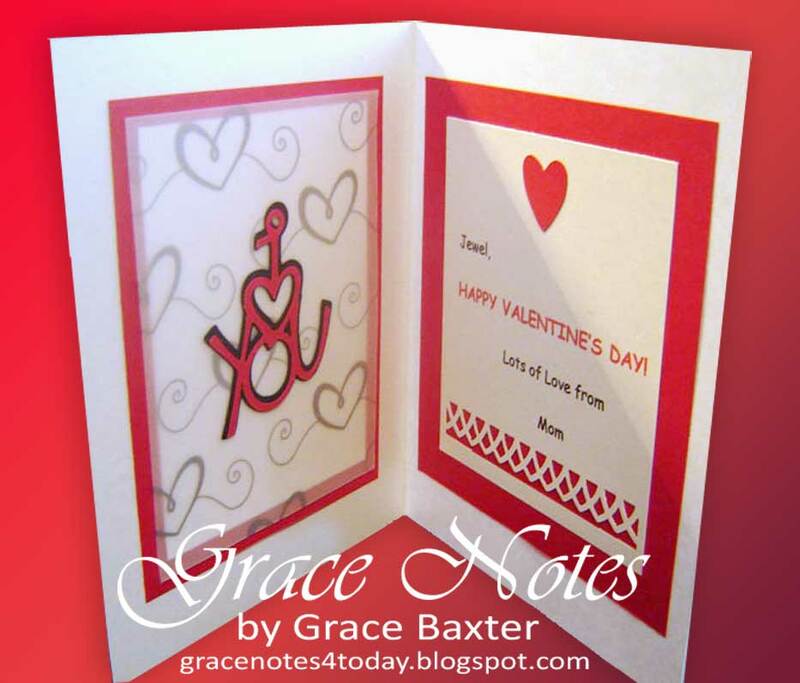 Inside, the card has an introductory page. 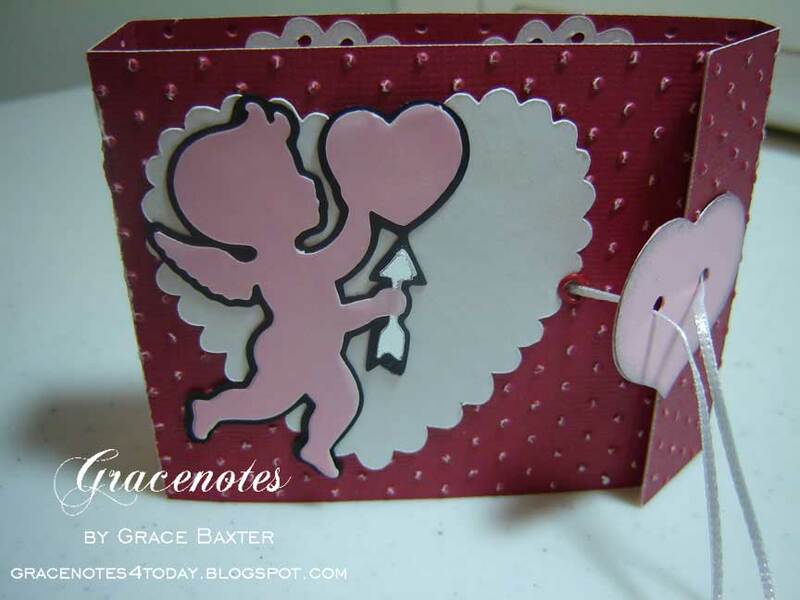 A small heart with another wee spray of tiny bleeding hearts is on the top panel, and a bible verse on the bottom of the page. That page lifts to reveal a personal message. 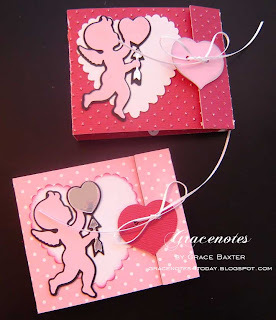 Next up... matchbook valentines. 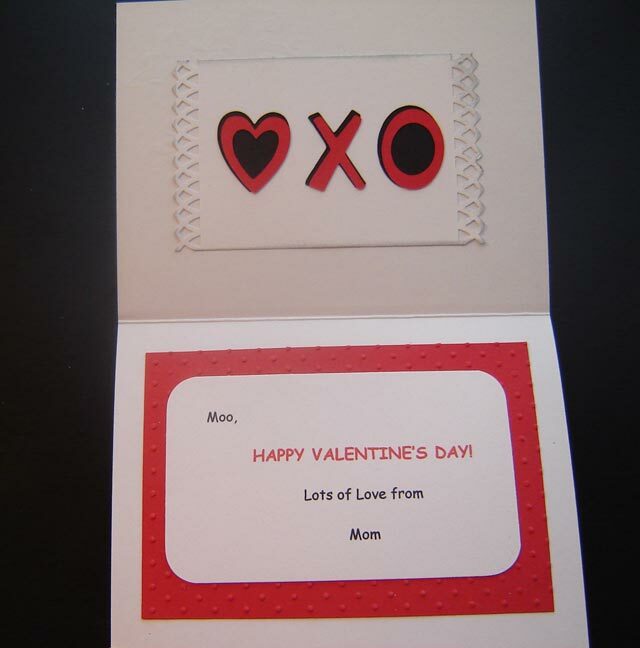 These were made with my daughters' boyfriends in mind. They couldn't be too girlie or mushy. But still, they needed to look like valentines. Each of these has what I call a "button" for the closure. They were fiddly but so much fun to make. 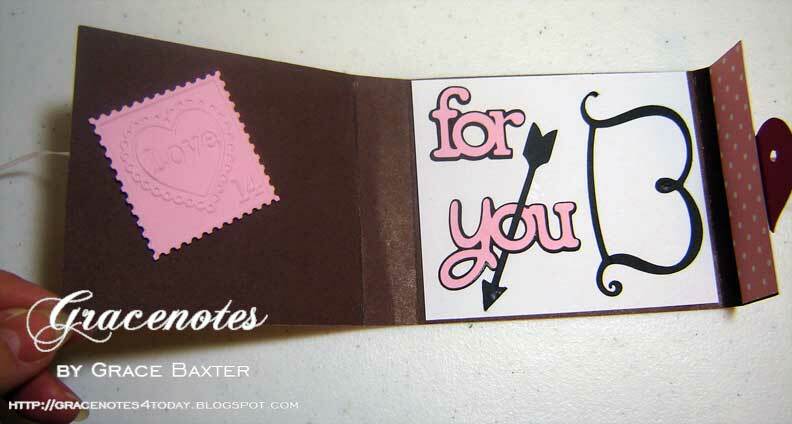 The pink card is brown inside. Masculine, eh? In case you don't think so, check out the inside photo. I added a very cool bow and arrow. See picture following. The red card looked much more scruffy once I embossed it. 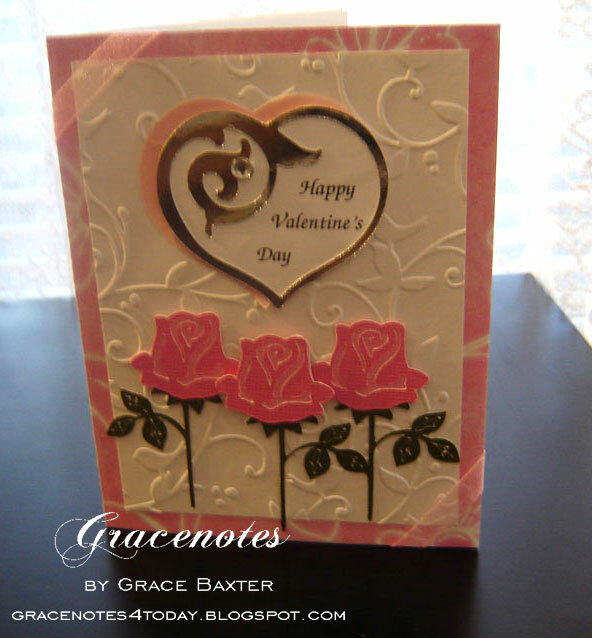 The card stock used has a white core which gives it an aged look when embossed. Masculine, right? These little guys don't work well in envelopes. I could've undone the closures and kept them flat in the envelopes. But I wanted them to look as they should, once opened. Also, these were not going through the mail so it was alright to have them look bulky and funny in the envelopes. Once opened, the guys understood the funny shape. Which cartridge did the roses come from? I love the bleeding hearts. So pretty and intricate. Beautiful job, Mom!